Civil Administration destroys Harel family farm, near Elon Moreh. Local residents: Arabs build illegally here, but government ignores it. Monday morning, the Civil Administration destroyed the Harel family's home, located near the community of Elon Moreh. Eliezer Harel says that he, along with his wife and their four children, chose to live on the farm out of love for his country. "This is a home that was intended to protect farming land and is located on state land. "Even though we suffered because of extreme leftists organizations, including Ezra Nawi, it's now the State of Israel that comes and destroys our home. Our home, we who came to support the State of Israel and to help keep the state lands. It's too absurd to describe and it's very painful." Many people in Samaria are similarly outraged, both by the destruction and by its timing. "This is absurd. Israeli residents in general and Samaria in particular, are dealing with terror now. Yet the government, the Ministry of Defense and the Civil Administration find the time to destroy homes sitting on state land and not bothering anyone," says Samaria Regional Council head Yossi Dagan. "I call on the government to come to its senses. Stop this outrage, and focus on restoring safety and a sense of security for the residents of Samaria and the State of Israel," he added. The head of the Elon Moreh community, Eliasaf Parshan, stated, "We are against the destructions in Judea and Samaria communities, everywhere and every time. Precisely during these days, in which we see the Palestinian incitement and terror raging across the country, I expect the security apparatus and the government to focus on the truly important things: to ensure the peace of its citizens and to fight terror and incitement." 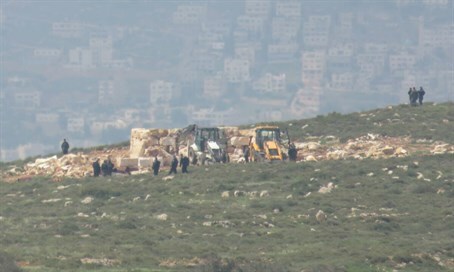 He continued: "The Defense Minister chooses to destroy an agricultural farm that connects Samaria and the Jordan Valley, completely blind to the illegal Palestinian construction breaking out all over the place, including on the same land where they destroyed the farm. The farm was chosen precisely because of this clear and disconcerting trend."